There has always been a dash of romance when it comes to Royal Air Force of Great Britain. Better known as the RAF, these British airmen were the ones who flew Spitfires against the Germans during 1940’s Battle of Britain. This was the battle that turned the tide of the Second World War, thus giving the previously unstoppable Luftwaffe its first taste of defeat. During that same conflict, the RAF also became a patriotic symbol of Britishness and Western resistance to Nazi tyranny. Americans joined the RAF before Washington entered the war, and veterans of earlier conflicts, from Poles to Czechs and Frenchmen, signed up with the world’s most famous air force in order to seek revenge on behalf of their nations. Almost none of this glamor is contained in Richard Overy’s RAF. This slim volume is an almost lifeless account of the formation of the Royal Air Force during World War I. Overy’s text is almost a blow-by-blow account of how two air services—the Royal Flying Corps of the British Army and the Royal Naval Air Service of the Royal Navy—were amalgamated into the RAF. This decision faced great resistance from both the Army and Navy, as both believed that air power only had use as a supplementary force. The squabbles that followed April 1, 1918 (the official founding date of the RAF) are extensively covered in this book. Early RAF officers fought over the best ranking system (Army, Navy, or a combination of both? ), the color of uniforms (Army khaki, Navy blue, or a new sky blue? ), and the best way to utilize air power (long-range bombing or support for ground and naval operations?). Many of these disputes, which featured an interesting cast of characters, including Winston Churchill, Lord Rothermere, and Prime Minister David Lloyd George, would come to define the identity of the RAF during World War II. For instance, Arthur “Bomber” Harris, the Marshal of the RAF during World War II and the man credited with the “area bombing” of German cities like Dresden, had already developed ideas about bombing civilian targets back in the 1920s, when the future of the RAF seemed anything but certain. Ultimately, Overy’s work concludes that the RAF was born out of public anger and had its future secured by politicians, not admirals or generals. Between 1916 and 1917, German airships and heavy bombers struck the English homeland several times, killing over four hundred civilians. Enraged by these attacks, civilians and their political representatives pushed for the creation of an independent air force. Then, after the war, the RAF looked like it was going to be cut by more fiscally conservative governments. However, after the RAF played a huge role in putting down the 1920 rebellion in British Mesopotamia (today’s Iraq), and especially after the RAF proved itself capable of policing British colonies on the cheap, the world’s first independent air arm managed to survive the lean 1920s and 1930s. 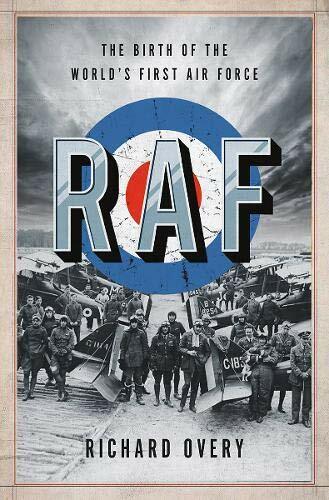 RAF is a high-quality book for enthusiasts and the nominally interested alike. In less than 200 pages, Overy details the earliest days of the RAF and how this plucky band of pilots managed survive so many public and private threats.